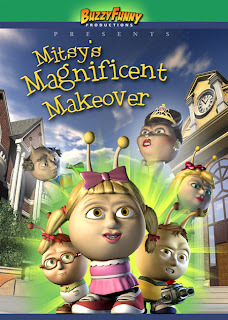 Why does the Cleveland Movie Blog, our tastes leaning a bit Ghoulardiward at all times, take note of a minor-key kiddie direct-to-video babysitter like MITSY'S MAGNIFICENT MAKEOVER? Does it represent the final, unreleased masterwork of Lucio Fulci? Does it include the famously censored decapitation scenes, finally discovered on Hong Kong laserdisc? Does it get away from the campy, silly Mitsy of the 1960s and back to the original, dark, brooding psychotic Mitsy of the 1930s and 40s? No, the deal is that this all-CGI semi-musical children's short feature (or long short subject) is that it represents yet another step forward for true "desktop filmmaking." Francis Ford Coppola, if my memory serves me right, prophesied that, with the advent of digital film and computer-editing suites affordable to the masses, someday the next CITIZEN KANE would not hail from a mighty Hollywood soundstage but rather from the bedroom of some adolescent Jewish girl in Cleveland. Well, MITSY'S MAGNIFICENT MAKEOVER is no CITIZEN KANE, nor does it come from Cleveland (that would be UNEMPLOYED GUY KANE; Coppola was a little off on that one), but it does show, I do believe, a significant step towards the prediction's fulfillment. MMM certainly looks a lot like a big-studio digital cartoon, if not Pixar-grade than at least JIMMY NEUTRON - BOY GENIUS. Yet, it was a two-person DIY project from Buzzyfunny Productions, which is/are California-based husband-and-wife actors-filmmakers Eric and Heather Smith. Apparently he's an industry professional, she's a teacher, and they had planned out some sort of fancy digital feature with producers on the theme of childhood self-esteem and bullying. When that whole project fell through, the pair simply did it themselves - using common 3D-modeling software (I would guess something akin to Bryce 3D, but I'm no expert) Eric's own plug-ins that enhanced skin tone especially, and a low-tech voiceover-recording studio in their home, blankets hanging to muffle sound and everything. The result: instant movie, and not looking too shabby. One does wonder where all the hundreds of millions of bucks for "hard drive space" and all that for creating digital landscapes really goes in the commercial film racket. Laundering all the drug money in Orange County? I could believe it after seeing this. The Smiths evoke a Fisher-Price-esque world of hopping, antennae'd, armless humanoids - the vaguely insectoid characters manipulate objects via telekinesis, and I would guess the physiognomy saves PC time rasterizing limbs, feet and fingers and stuff. Small-town schoolgirl/school-thing Mitsy is throwing a birthday party, but fickle classmates spurn her for rich mean-girl Leelu Belle, daughter of a laid-back rock star called Ringo Belle his less likeable, aging-supermodel wife. Rebounding from the snub, mishap-prone Mitsy and friends Hermie and Falwell discover Mrs. Belle is secretly in league with sinister Dr. Façade, her high-tech cosmetologist, who on the side has been experimenting with a mind-control gimmick. At a big charity concert the baddies plan to unleash the device, a tiara by which Leelu's mom can hypnotize the townsfolk and be irresistibly popular. Yes, the material is a bit thin even by CARS 2 standards, though there is a very funny RAIDERS OF THE LOST ARK takeoff at the start. The character-building message about self-acceptance is on the level of, I guess, a secular version of the "Veggie Tales" franchise, with which I have little experience but which I don't believe was a total garage-filmmaking effort like this. I am Mrs. Smith of the above-mentioned Smiths. Thanks for mentioning us in your website AND for the favorable review in the Video Librarian magazine. We appreciated it. I just want to make a wee comment here. Before embarking on this journey we took out a loan, worked on the script for a LONG time (while Eric continued to do his "day job"-- creating 3D animation of root canals. You read that right-- root canal training videos for endodontists. Truly mind-numbing.) He made a very detailed plan with every month, every week, every day planned out so all could be completed in 2 years. (Our goal was to get the video out in fall, in time for Christmas purchases.) Once the script was "set," he phased out of full-time freelancing and devoted his time to Mitsy's Magnificent Makeover. And, in spite of various obstacles and some script re-writing, he got it done. So... if there really is an independent artist out there who has the likes of Citizen Kane in him/her, I hope that person is either like my husband or has a friend like my husband who is an integral part of the project. Otherwise, in spite of digital film equipment, software, etc., true desktop film-making magic will remain an empty prophecy from Francis Ford Coppola.